The New Humanitarian | "Yesterday was better than today"
A young girl hangs on Lamine's* shoulder, whispers to him and lingers until he gently tells her to go back to playing with her friends. "You see that?" Lamine says, throwing up his hands. "My daughter's hungry and I don’t even have 1,000 Guinean francs (20 US cents) to give her." 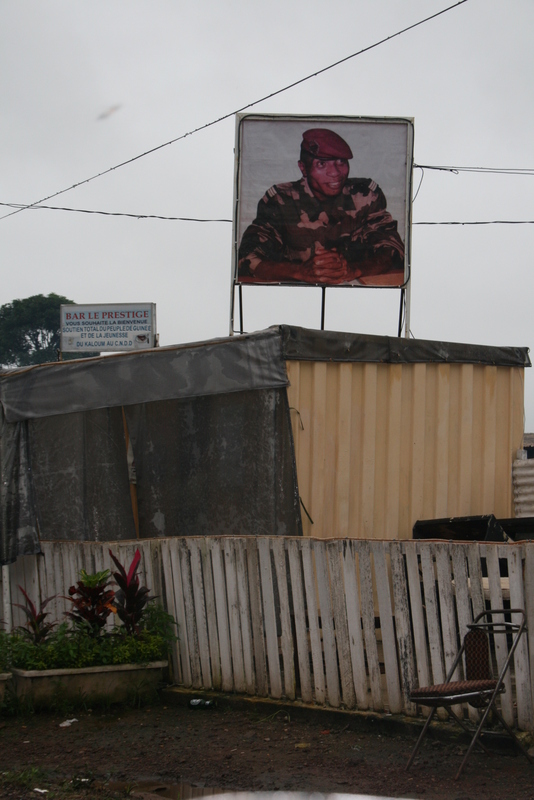 Seated next to him in a matching plastic chair near an intersection in Guinea’s capital Conakry is Georges*. "What is particularly tough these days is providing enough food for the family," Georges says. "The maximum anyone is earning per month is 600,000 Guinean francs [US$123]. Imagine that. You buy rice, you pay your rent - an average of 150,000 Gf - you pay water and electricity. Each day [you need] 15,000 or 20,000 Gf to have at least a bit to eat. If you want to eat meat make that 30,000. "We are constantly in debt. All Guineans are worried about how to keep their households going." Georges: “The so-called salary we receive, even for civil servants, is solely to prevent us from dying. As heads of households we are perpetually humiliated. We cannot even meet our children’s most basic needs." They are among several men – friends since school – who meet nightly to chat about the news of the day, from a death or marriage in the family to the latest pronouncement from junta leader Moussa Dadis Camara. They do not want IRIN to disclose which neighbourhood they come from or their names. These days many Guineans are afraid to lament publicly the country’s current situation. Camara took power in a coup after the death of Lansana Conté in December 2008. Guineans’ living conditions have been dire for decades. Despite immense mineral resources, extreme poverty is widespread, and apart from a wealthy elite, few people have regular access to safe water and mains electricity. Guinea ranks 167 out of 179 countries in terms of basic human development indicators like health and literacy. The World Bank in a March brief said the difficulties posed by Guinea's "high-risk environment" have undermined mining revenues and the pace of foreign direct investments. The men at the roadside in Conakry – many of them civil servants – say economic hardship was there during Conté’s regime, but added to it now are fear of the junta and an atmosphere of utter uncertainty and insecurity. “Next week if I get paid I will buy a [50-kilogram] sack of rice and condiments for my family because we do not know when things could blow up. But things are going to blow up – it is obvious,” Lamine says. 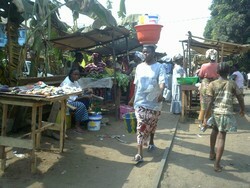 The International Crisis Group in a March report said Guinea was at risk of a counter-coup by disgruntled army elements. “Whenever you go out you are gripped by fear,” Madou says. They point to the crossroads next to where they sit, where they say policemen regularly direct traffic. Once they saw a soldier defy traffic restrictions and when the policeman intervened the soldier hit him with his gun. Then the soldier shot twice in the air, saying, “The country is under orders”. Human Rights Watch said in July that the junta was undermining human rights by arbitrary arrests and detentions and a failure to punish criminal acts by the military. Guineans initially had applauded the junta, which pushed aside would-be leaders close to former President Conté – officials Guineans saw as a continuation of the past regime. Citizens say they saw “Dadis”, as he is called, as signifying a break with the past. Eight months on: “We are completely let down and frankly we are surprised at this let-down,” says Lamine. Disillusioned because they have seen none of the improvements they had hoped for, a member of a civil society organization told IRIN. “At the beginning people wanted change at any price, no matter who was coming into power. Now they are seeing that simply change for change’s sake was not the answer,” he said, requesting anonymity “because [those in power] are the ones with the arms and we don’t know where this country is going”. Might the people rise up? And the role of the international community? Not everyone is dissatisfied with Camara. Some Guineans say only a soldier can make concrete steps towards cleaning up corruption and drug trafficking in the country, and that Camara should be left to continue what he has started. One university student who requested anonymity echoed the views of some Guineans who said they were impressed with how Camara had dared to go after corrupt officials, arresting many prominent members of the military, including the former president's son. “We the youth – we have hope today,” he said, noting also that the junta has re-established youth centres throughout Conakry. But the student said he was dismayed at Camara's ambiguity about whether he will run for president in elections currently set for January 2010. In recent weeks a group has formed – MDDR, or Mouvement Dadis Doit Rester (Dadis Must Stay Movement). Camara came to power pledging he was not seeking to remain in office, but since then he has wavered on the question. In a 19 August exchange with journalists he said whether he would be a candidate “is up to God”.